Stephen Okechukwu Keshi, popularly known as the Big Boss, was a football manager of the Nigerian national football team the Super Eagles up until October 16, 2014. The former football defender started managing the Nigeria national team in 2011. Stephen Keshi was born on January 23, 1962, in Azare, Bauchi state, Nigeria. After a playing career mostly with Belgian clubs, Keshi went to the United States to be educated in coaching. He was a key player of the Nigerian national team and appeared at the 1994 FIFA World Cup, played in five African Cup of Nations championships and was a part of the team, when they won the 1994 African Cup of Nations. In 1996, Keshi and Augustine Eguavoen, who once coached the Nigerian national team, played together in California as the backbone of the defence for the short-lived Sacramento Scorpions. Between 2004 and 2006 Keshi coached the Togo national football team. In 2006, Keshi brought them to their first World Cup tournament. After Keshi guided the Mali national team for two seasons (2008-2010), he was appointed the head coach of the Nigeria national team in 2011. In 2013, Stephen guided the Eagles to the African Cup of Nations title. At 2014 World Cup in Brazil Nigeria made it to the round of 16, but lost to France. He is one of only two people, along with Egypt's Mahmoud El-Gohary, to have won the Africa Cup of Nations as both a player and a coach. After the match with France, Stephen Keshi announced his resignation as the Super Eagles coach. However, later the Nigerian Football Federation offered him to coach two more matches. In October 2014, he claimed to have lost interest in continuing the job, following the breakdown of negotiations. 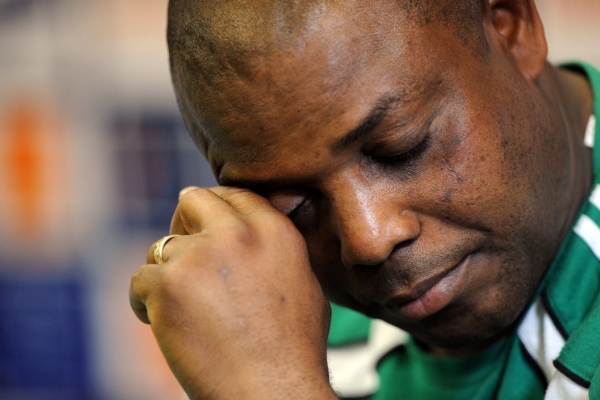 Keshi has passed away in Benin City, Edo state, in the early hours of Wednesday, June 8.